Hundreds more from Luzon were stranded in Allen town after ferry services were suspended because of the storm. Eddie Picardal, information officer of the provincial government, said the pilgrims were stranded in Lope de Vega town had to seek refuge at the church and the municipal hall. Other pilgrims found themselves stuck in Calbayog City and had to sleep inside the buses ferrying them. These pilgrims were unlikely to continue on their way Sunday morning as landslides in Barangays Capakohan and Mag-ubay in Calbayog’s Oquendo district had closed the road leading to Northern Samar. Karen Gajutos, a youth coordinator, said the Nothern Samar pilgrims had gone to Leyte in 50 buses, 37 other private vehicles, and an undetermined number of trucks. The Provincial Disaster Risk Reduction and Management Council, in a press briefing Saturday evening, said the floods triggered by Amang, which made landfall over Eastern Samar hours earlier, had flooded Catarman, Lope de Vega, Las Navas, Catubig, San Roque, Rosario and Bobon, the same areas inundated when typhoons Glenda, Ruby and Seniang struck last year. As of this posting, Las Navas and Catubig remain underwater. While no casualties have been reported, the PDRRMC said the floods sent 10,000 people fleeing their homes. The National Disaster Risk Reduction and Management Council recorded 1,381 families evacuated in three Samar provinces: 1,094 in Borongan City, Eastern Samar; 52 in Dolores, Eastern Samar; and 235 in Catbalogan City, Samar. Amang also cut power throughout Eastern Samar, Northern Samar, Leyte, and Samar. 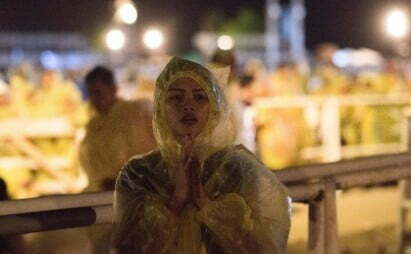 In Allen, hundreds of buses, trucks and private vehicles, many ferrying home pilgrims from Luzon, were stranded at the town port, acting Governor Eddie Picardal said. They were unlikely to be able to board ferries on Sunday as Northern Samar remained under public storm warning Signal No. 2. Interisland ferry services are automatically suspended when the weather bureau raises Signal No. 1. The provincial government has released 20 sacks of rice and six boxes of sardines for those stranded in Allen.